HERNANDEZ, Sonia L et al. 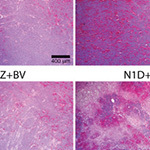 Notch and VEGF pathways play distinct but complementary roles in tumor angiogenesis. Vascular Cell, [S.l. ], v. 5, n. 1, p. 17, sep. 2013. ISSN 2045-824X. Available at: <https://vascularcell.com/index.php/vc/article/view/10.1186-2045-824X-5-17>. Date accessed: 22 apr. 2019. doi: http://dx.doi.org/10.1186/2045-824X-5-17.